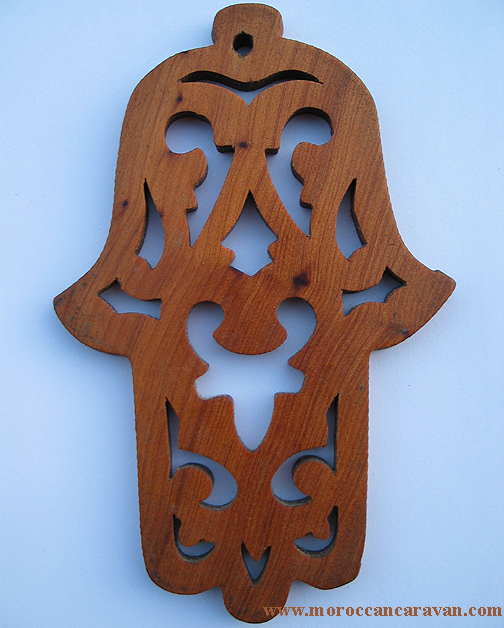 This is handmade hand, also called khamsa, from thuya wood. Thuya is related to cedar and has a wonderful aroma and only comes from Morocco. It symbolizes protection against the evil eye. Hang it up anywhere around your home and or office for good luck. Much of the jewelry worn by women and other items with the hand motif such as door knockers and or hanging items on the wall or incorporated in textiles in Morocco has a spiritual significance and offers protection to the wearer. The hand motif is called a khamsa, which is the Arabic world for “five.” The number five is an auspicious number and protects against the evil eye. The evil eye can be described as a glance or look accompanied by a compliment, which is dangerous because compliments are connected with envy and covetousness. Hence, a person’s good fortune, health or looks can activate the evil eye. Bad luck, illness, and even death are often attributed to the evil eye. The first glance of a person is considered the most dangerous. Hence, people wear or hang the khamsa to attract attention so that a person focuses on the attached object rather than the actual person. This way the negative first glance is deflected and prevents the person from being harmed.